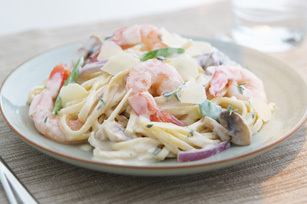 Linguine gets tossed in a cream sauce with shrimp and delicious vegetables. In less than 30 minutes, this restaurant-worthy pasta makes it to the table for all to enjoy! Cook pasta as directed on package, omitting salt; drain, reserving 1/3 cup cooking water. Heat oil in large nonstick skillet on medium heat. Add shrimp, mushrooms, onions and thyme; cook and stir 3 to 4 min. or until shrimp turn pink. Stir in peas and garlic; cook 1 min. Add cream cheese product and milk; cook and stir 1 to 2 min. or until cream cheese is melted. Gradually stir in enough of the reserved pasta cooking water until sauce is of desired consistency. Add pasta; mix lightly. Top with Parmesan. Substitute sugar snap peas or frozen garden peas for the snow peas. Omit garlic and thyme, and prepare using Philadelphia Herb & Garlic Cream Cheese Product. Garnish with lemon slices for squeezing over each serving of the finished pasta dish.